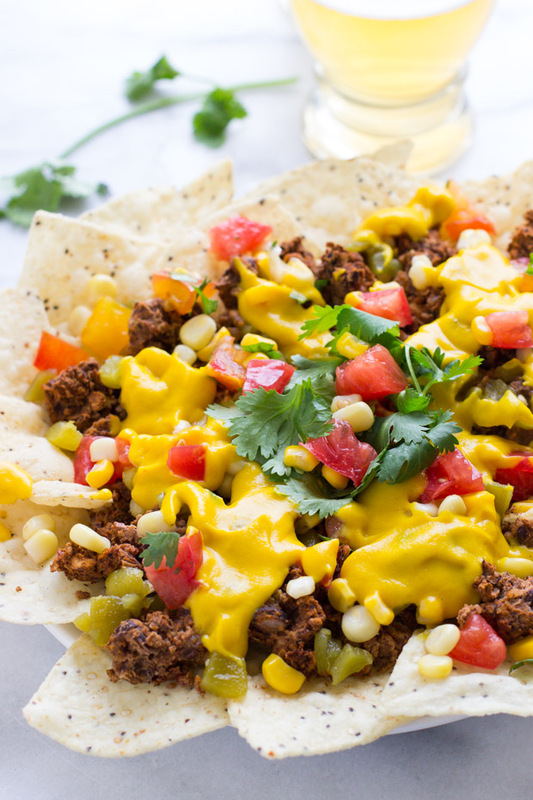 Loaded Vegan Chili Cheese Nachos are so flavorful you would never guess that they’re vegan! They’re also gluten-free, nut-free and seed-free, making them a great alternative for those with allergies. A cool breeze rolled in this week and got me excited for all things fall. Like wearing soft cozy sweaters, drinking warm apple cider and watching the vineyard leaves change colors. And while there might be a few weeks left until it officially begins, as soon as football season starts I feel like it might as well be the case. I can’t really explain why, it’s just a feeling I get when I hear the sound of the broadcaster’s voice on the TV. Anyways, when it comes to football food, nothing makes me happier than a big plate of nachos and an ice cold beer! Unfortunately, between the beer and the dairy my stomach isn’t always a happy camper. Like I go from having a mini belly pooch to a nine months pregnant pooch as soon as I’m done eating. It’s not cute. So I set out to create a vegan version that won’t do quite as much damage but also won’t skimp in the flavor department. And you can trust me when I say that these definitely do not skimp on flavor. 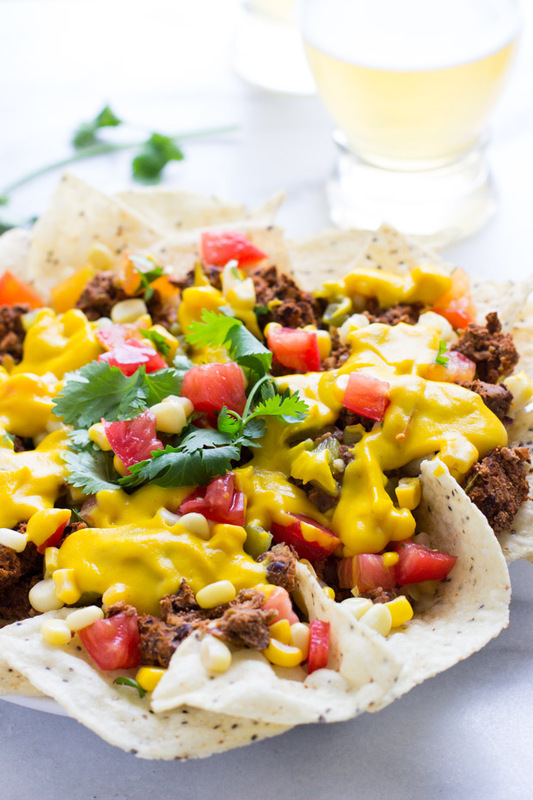 Besides a good mix of my favorite spices (cumin, smoked paprika, and chili powder) the main base of the nachos are made with chipotle peppers in adobo sauce, aka the best Mexican invention ever. Seriously, if you’ve never cooked with them before you’ve got to give it a try. 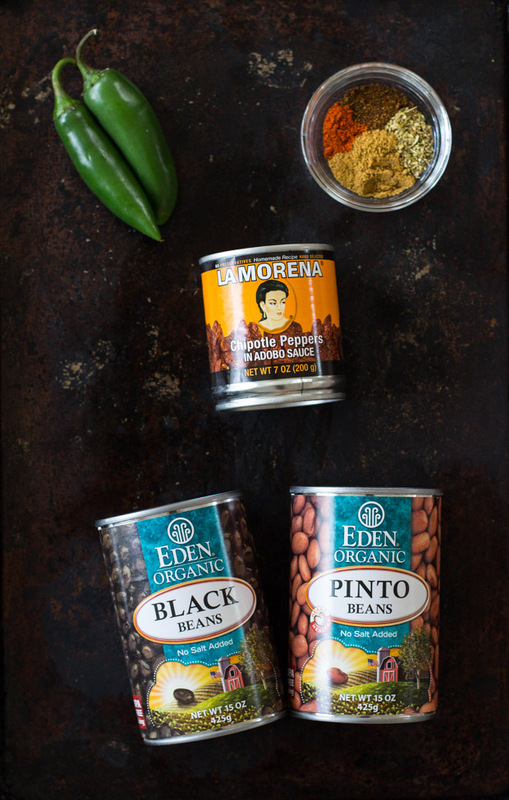 They have this incredible flavor that’s slightly smoky and can take any Mexican dish from good to WOW. They can pretty spicy if you use too many. 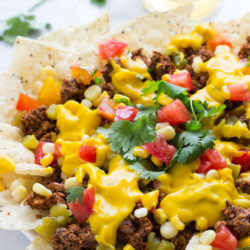 The first time I made these nachos, I used the whole can and I was definitely blowing my nose while eating them. Brandon, on the other hand, loves super spicy food so he was in heaven. So for my mild-to-medium heat taste bud preferences, I wrote the recipe only using one pepper but you can add more (or less!) if you like things really spicy. The base for these was inspired by Black Bean Pecan Tacos but I left out the nuts because I wanted to make this and the queso entirely nut free. It’s super easy to make, all you have to do is blend everything in the processer for a few seconds then bake it in the oven for 15 minutes. I personally like to top my nachos with tomato corn salsa so I included a simple recipe for that as well. 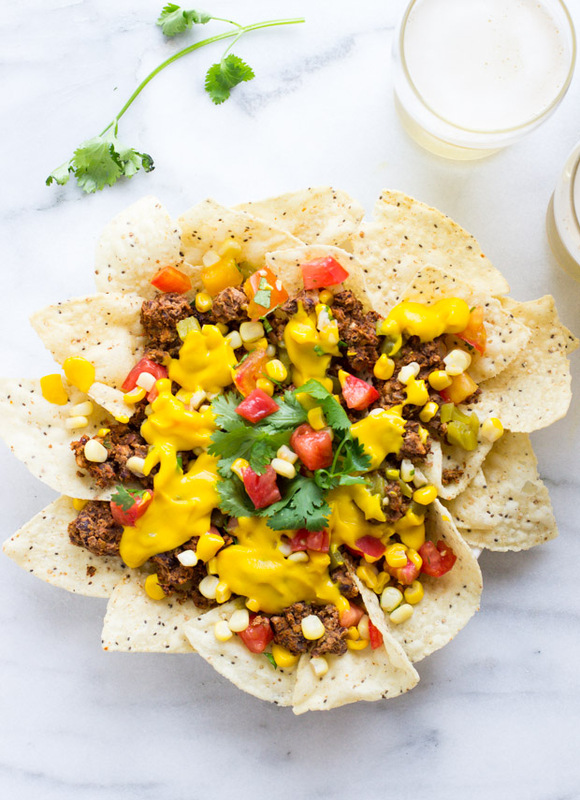 All of that deliciousness gets topped off with my Healthy Vegan Queso for a plate of nachos that will seriously blow your mind! I hope you guys love these as much as we do! Please let me know if you end up trying them by leaving a comment below or sharing a photo on Instagram with the hashtag #makingthymeforhealth. Cheers! Preheat the oven to 400°F and then line a baking sheet with parchment paper. 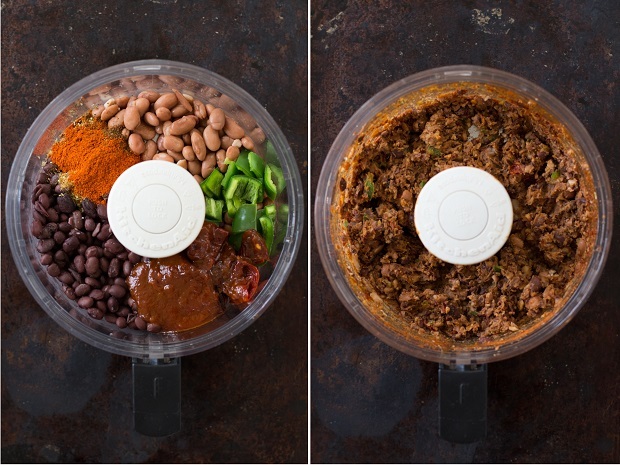 Combine all of the ingredients (beans to chili powder) in a food processor and pulse until a chunky mixture forms, being careful not to over process. Spread the mixture onto the baking sheet and bake in the oven for 10 minutes, stirring half way through. 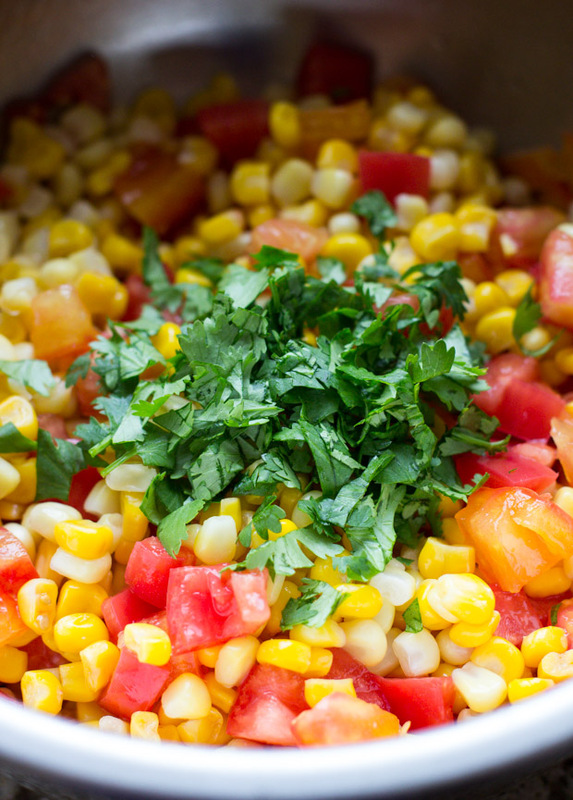 Meanwhile, prepare the corn tomato salsa by combining the ingredients in a large bowl and stirring together. Spread tortilla chips out on two large plates then top with cooked bean mixture, vegan queso, corn salsa, avocado or other desired toppings. Serve immediately and enjoy!